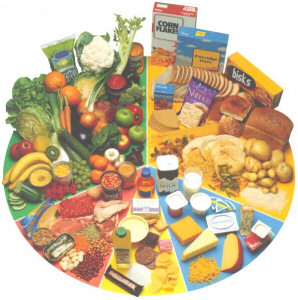 Your doctor or healthcare provider is the best source of information about what you should eat. You need food for fuel to run your body's machine, such as your heart and other organs, and your muscles that allow you to move. Your body also needs food to grow and to make repairs. fiber - contained in whole grains (whole grain cereals and breads), and in salads, fresh vegetables, and fruits. Protein is what your body uses to grow and make repairs. Carbohydrate and fat are what your body uses for fuel. 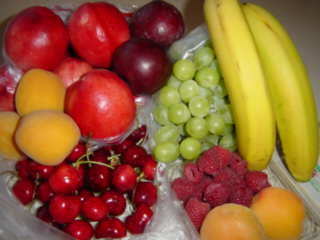 Your body also needs vitamins and minerals and fiber (from salads, fruits, and vegetables). Your body will use protein for fuel if there is not enough carbohydrate and fat in your diet, which is what can happen if you lose weight by not eating at all. Not eating is dangerous and can cause your growth to stop and can hurt your body's development. Foods that contain a lot of fat, like butter, cream, oils, and animal fat like bacon contain more than twice as much fuel as foods that do not, like beans, lean meat, and rice. Therefore, if you overeat foods with a lot of fat in them, you will gain more than twice as much weight as compared to foods low in fat. You can look at the labels on food to see how many grams of fat they contain. What is "junk food"? Most of us think of junk food as foods like chips, cookies, ice cream, pizza, pop, candy... Actually junk food is any food that does not help to maintain good health. Eating a lot of junk food can be harmful to your health. Foods that are high in heavy fat (called "saturated" fat) like ice cream and animal fat, or foods high in sugar, are hard on your body. 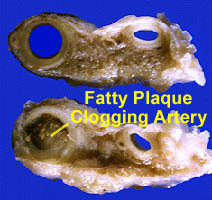 Saturated fat can deposit on the insides of your arteries and clog these arteries with a thing called "fatty plaque". Clogged arteries prevent blood from getting to your vital organs (heart, brain, kidneys) and can result in heart attacks, high blood pressure, strokes, senile mental state, and kidney failure. Clogging of the arteries is not just a disease of adults, it can start as young as three years of age. To avoid clogged arteries it helps to replace saturated fat in your diet with unsaturated fat (here is an article with some tips). "Fast foods" like cheese-burgers, fries, chicken nuggets, pizza, and milkshakes are high in fat. If you eat a lot of fast foods, unfortunately overweight usually results. High sugar foods like candy and pop cause tooth decay and stress the pancreas which can trigger diabetes. High sugar foods are also high in calories (fuel), and if not burned up by exercise, the sugar will be converted to fat and will result in weight gain. So... what is healthy eating? Healthy eating is simply eating the foods your body needs for energy and for growth, and eating only limited amounts of the foods that can harm your body like junk food and saturated fat. Your body needs protein like lean meats, fish, poultry, dry-roasted nuts, beans, and skim milk for growth and repairs. It needs carbohydrates like whole grain cereals and breads, and unsaturated fat like vegetable oil, for energy. Your body also needs vitamins and fiber. Vitamins keep your body running smoothly, and fiber helps get rid of chemicals and prevent cancer. Most junk food does not contain much fiber or vitamins. 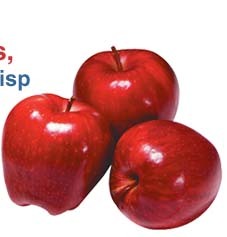 Fruits (like apples) and vegetables (like carrots) contain both fiber and vitamins. At left is a video on "Healthy Fixings", created by nursing students, that may provide some ideas for you on healthy snacks and lunches that you can fix by yourself. To see the video, click on the picture at left, or click here. 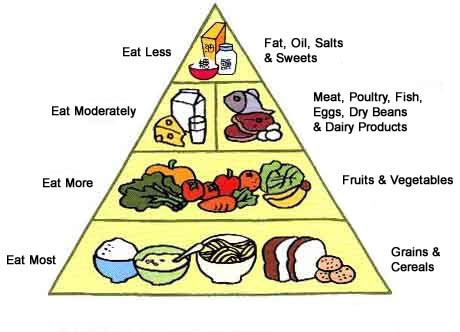 Many doctors and dietitians recommend something called the "Food Pyramid" as a way to help choose healthy foods and a "balanced" diet. The most recently published food pyramid is shown below. Generally, one approach to weight loss is to eat foods from all the major Food Pyramid groups, but reduce serving sizes a little bit. And foods at the top of the pyramid should be eaten in less amount and less frequently than foods at the bottom. It has been said that, "If you eat mainly at the top of the food pyramid, you will look like the bottom of the pyramid."